Cooking fish couldn't be simpler and doesn't get any better than this recipe. There is no call to go tarting up good fresh fish. The best way is to keep it simple and with simple flavours. People are forever saying that it is tricky to cook fish but take it from me that it's dead easy to cook fish. The trick is not to overcook it ,Once it's starts to turn from opaque to white, it's cooked and slightly undercooked is a hell of a lot better than overcooked to cotton wool consistency. Here I am using some delicate Thai flavours which makes this dish very very tasty. 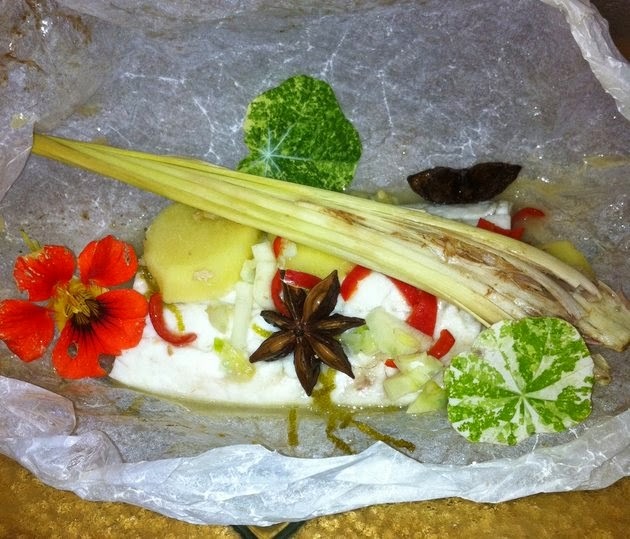 Cooking " en papillotte " is literally cooking in a sealed parcel made out of parchment paper and if you're in an Al Fresco mood, wrap in tin foil and cook over the BBQ. Place a baking tray in the oven and pre- heat to 220c. Mix all the ingredients with the exception of the fish. Cut out 2 large circles of parchment paper. Crunch up into a ball and soak in cold water under the tap. Ease it back out into a circle and lay each fillet of sea bass onto the paper, Drizzle over some of the sauce with a piece of lemongrass and a star anise on top. Fold over the outer edge of the circle,taking both edges , fold over and twist,thus sealing the edges of the paper together to form a sealed package. Place on the baking tray and bake in the oven for 10-12 mins. ©2012-2014;Robert Jacob;jacob'scrackers;jacobscrackers9; All rights reserved. Courgetti & Irish Haddock Fillets , A bistro - style Classic Revamped ....." Inexpensive and Low calorie "
Persian Aubergine ....Nothing compares to Comfort Food, " Inexpensive & Low Calorie "
©2012-2013;Robert Jacob;jacob'scrackers;jacobscrackers9; All rights reserved. All content published on jacobcrackers.blogspot.com are the sole property of Robert Jacob.Please do not modify;copy or paste content as excerpts or in it's entirety including photographs without written permission from the owner of this site .